In Windows 10 Insider Preview 17666 (RS5), the pre-evaluation program participants enjoyed the opportunity to test an early version of Microsoft’s cloud clipboard. At the request of non-insider community members, we publish several screenshots of the new feature. The user can configure the clipboard manager in the new section of the Options → System panel, which received the self-explanatory name Clipboard. 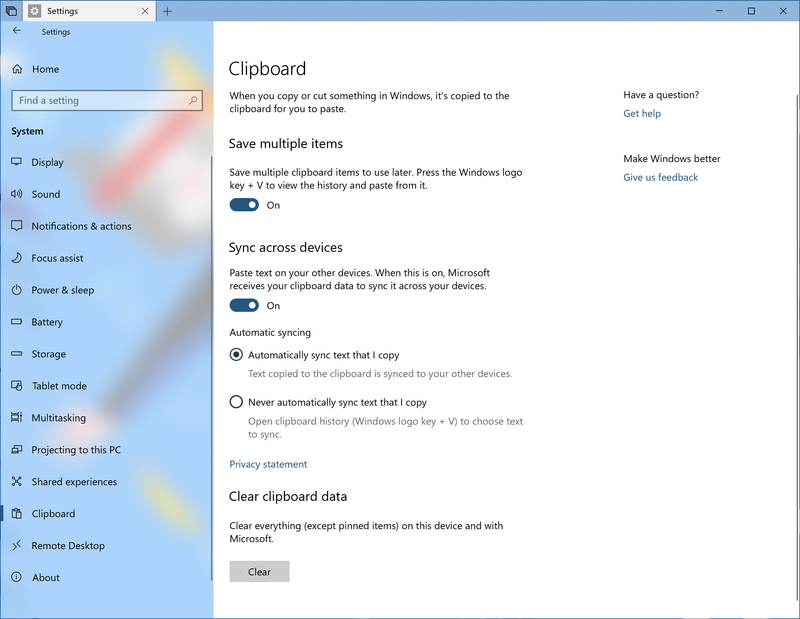 Here, you can enable or disable the clipboard usage history and the synchronization between devices, and clear the clipboard data stored on the local device and on the Microsoft servers. The synchronization feature has manual and automatic modes; this option is also to be configured in Parameters. You can conjure up the clipboard history by pressing the Win+V keys; by default, the window is displayed right next to the cursor. The clipboard elements are presented as cards; you can easily remove the unused items or pin the frequently used ones. When you enable manual synchronization of data between your devices, one more tiny button will appear on the cards. It’s designed to upload the card content to the Clipboard. If the cursor isn’t in any text field, the clipboard manager window is displayed in the lower left corner of the screen. However, in the current build of Insider Preview, the window may appear in any area of the screen. Moreover, you can not drag it around. But what could be expected of an early version? If you have disabled the clipboard history in Parameters, then the hotkey combination Win+V will conjure up a window with the clipboard icon and an error message. A similar error message is displayed when the clipboard history is empty. Once again, it’s worth recalling that the above screenshots demonstrate the early version of the new feature. Much can change before the launch of the final version, which is going to take place this autumn.